So I recently switched my internet provider in order to get an attractive monthly deal only to realize the day after installation that the provider (AT&T U-verse) has a monthly 250Gb data cap. This may sound like a lot of data, and in fact the customer service rep tried to assure me that no one goes over that limit, but this is simply not the case. 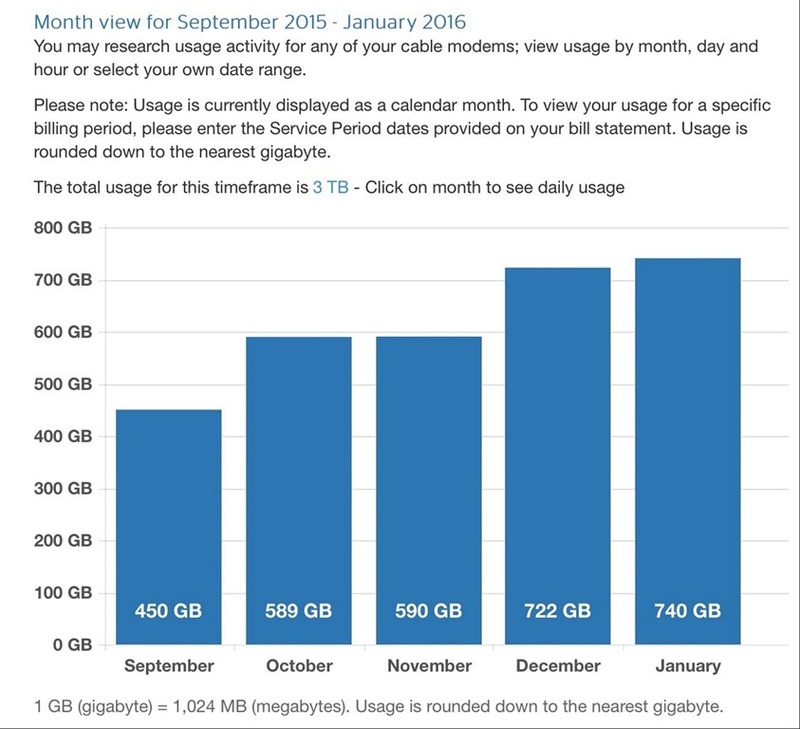 What makes matters worse is that AT&T gives you no way of proactively tracking bandwidth usage, you are essentially completely blind for the entire month. They do apparently send alerts when you are at 60% and 90% usage but after that you can expect to pay an additional $10 for every 50GB used. So now knowing exactly how much data I am consuming has now become really important. Push left on your navigation and go down to Settings button. Push left again and select All Settings. The data usage over the last 12 hours is really useful, I can figure out (very roughly) how much bandwidth each app was using. Surprisingly Sling TV usage was the highest at about 2.5 Gb per hour, while Hulu and Netflix fluctuated between 1Gb and 1.5Gb per hour. I really think Hulu and Netflix have mastered optimizing video streaming, while solid and consistent viewing is sometimes elusive with SlingTV, but then I am sure streaming live TV is different kind of challenge. The historical bandwidth is important here because with this device alone I regularly go well over the 250Gb monthly limit. Considering I have two Rokus, several PCs, tablets and smartphones it is immediately apparent that this new arrangement with AT&T will be very expensive. Clearly I made a mistake moving to AT&T and I will need to rectify that forthwith. My advice is to you is to understand how much data you need to consume and read the fine print especially as it relates to data caps, it can make a tremendous difference to your viewing habits and your monthly bill. Also I have to say, in Columbus Ohio, Time Warner Cable provides the best internet service for cable cutters. PS. I assume the more technically savvy among us will probably go straight to the wireless routers to measure data consumption.